New to our Turkish programme in 2019 is the beautiful villa of Notoc, which lies adjacent to its identical twin, Nova. 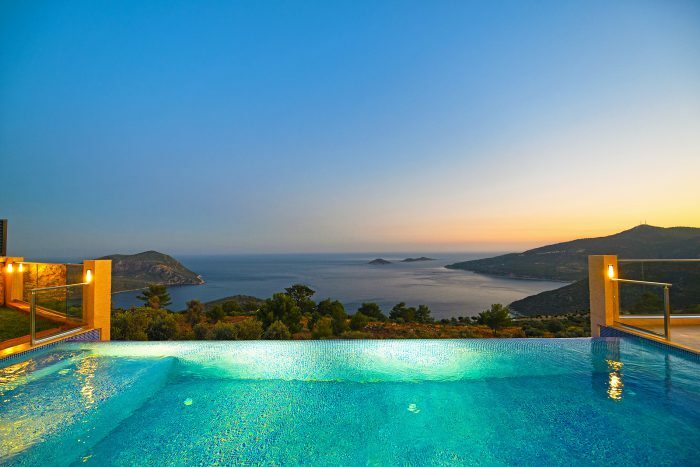 These stunning contemporary villas are just several kilometres from the exquisite harbour-side town of Kalkan. Nova is a two-bedroom villa that sleeps up to four guests. Being just a stone’s throw from its twin, Nova, these modern villas are perfect for two families wanting to holiday together. Notoc has everything you’ll need for a comfortable stay in one of the most picturesque and sought-after areas of Turkey, including air-conditioning, Wi-Fi, en-suite bedrooms, a modern, fully-equipped kitchen, and an open-plan living room that opens onto a spacious sun terrace. This fabulous villa takes comfort to new heights, with an indoor pool, a sauna and a traditional Turkish hamman. As delightful is Notoc’s interior, the villa is designed for spending time outdoors and making the most of Turkey’s warm, sunny climate and the incredible views the property enjoys looking down on the pretty town of Kalkan and the beautiful coast that stretches from this exclusive bay in both directions. Notoc’s infinity edge outdoor pool is an idyllic spot to enjoy these unrivalled views, while cooling down from the hot sun soaring overhead. A barbecue and shaded grassy seated area encourage guests to wine and dine outside and soak up the breath-taking vista both Notoc and Nova enjoy. If you can manage to drag yourself away from this well-facilitated modern villa, a trip to the town of Kalkan is highly recommended. This upmarket Turkish town, not far from Notoc, is described as the “St. Tropez of Turkey.” Despite its exclusive and cosmopolitan façade, Kalkan has retained much of its traditional, authentic charm as an old fishing harbour. The quaint cobbled streets of the Old Town have been sympathetically restored to be in-keeping with the character of the town’s original fishing harbour. Seafood lovers will be at home in Kalkan’s old harbour where there are quality seafood restaurants, relaxing spots for lazy lunches looking across the azure water of the Mediterranean twinkling under the sun. To view photos of this stunning villa, to check availability and to book to stay here, visit Notoc’s webpage.